There are many types of people when it comes to meat: The ones who can not bear to touch or the smell when cooking but eat it as long as they are not involved in the process, those who would not touch, smell or eat any meat and the ones who can handle pretty much any meat and eat it as well. Or maybe selective ones like my mom, whose stomach can not handle cleaning fish but can easily make meatballs. I am almost like my grandmother. I believe that if I can handle eating it, I should also clean and cook it. I can not kill my meat, that is the only difference between us. But I am sure if I am trained, I can handle that as well. In Turkey, as opposed to what you might think, we are not only eating kebabs and doner (gyros) all the time. We make use of different parts of animals and try not to waste any edible part. For example, my dad used to make a killer tripe soup which is the best cure for late night drinking and hangover. 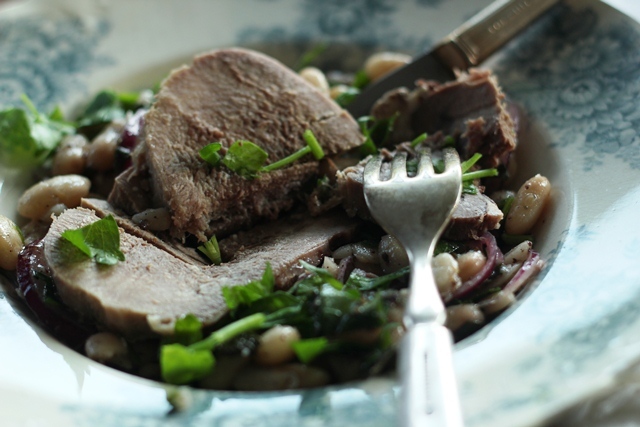 We use kidney in several very common dishes. Oh my fried liver! Let’s not forget the heart as well. 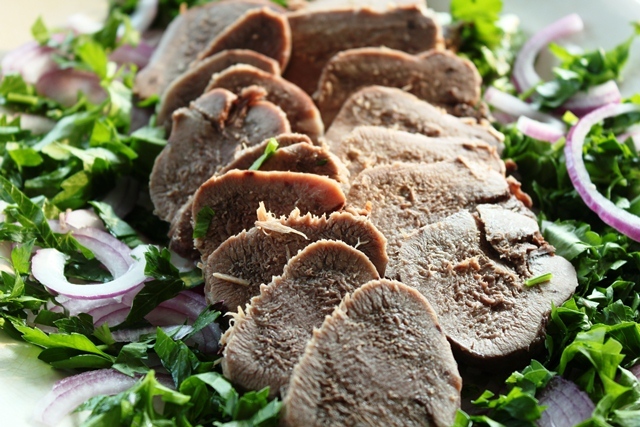 And there are several dishes that might be hard to convince some people to eat: Kokorec (filled sheep intestines) as a quick street food, lamb brain and thinly sliced beef tongue as appetizer at your raki table. Cooking and preparing tongue requires you to get over the”gross” factor if you are not used to it. First of all, the tongue is in one piece, in tongue shape, very recognizable which Jay finds it hard to look at and also eat because of that. Secondly,a white-grayish skin covers the whole tongue which becomes more visible and harder after it cooks. Then you have to peel that skin off, leaving the meat exposed. After that, still reserving the tongue shape, you wrap it with a plastic wrap, keep it in the fridge for a while. The colder it gets, the easier it is to slice it against the grain. 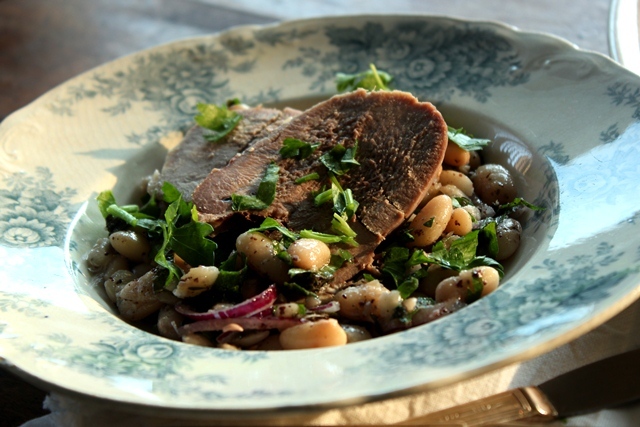 The beef tongue has a lean, light taste, almost bland that does not overpower the dishes. I love it especially when it is cold but just because that is how I was used to it since I was a child. You can make a onion-herb relish to serve it on a slice of toasted crusty bread. For a whole week, they were my deli meat in the sandwiches. And I was pleasantly surprised to find out that the Latin cuisine has some delicious tongue dishes. I ate some of them in Bolivia several years back which makes me crave for them now. I loved the stew there and I am hoping to make it once the weather gets cooler. Since Jay finds the whole process unappetizing, maybe I can get it done when he is not around and make it “unrecognizable” in a stew! So what kind are you? How close do you get to your meat? 1. Wash the tongue and put in a big stock pot. Add enough water to cover the whole tongue. 2. Bring it to a boil, boil several minutes, skim the foam off of the top and discard. 3. Add bay leaves, several pinches of salt and one pinch of black pepper. Add more water if necessary to cover. On a medium heat, simmer gently for 4-5 hours, until it is cooked. 4. Once cooked, turn off the stove and let it cool in the pot without draining. 5. After it cools, peel the skin off and cut any fat at the back of the tongue. Scrape off any visible skin with the knife. 6. Wrap it in plastic, keep it in the fridge for several hours, before slicing and serving on a bed of red onion and parsley. Sprinkle more salt if necessary. There’s a Mexican tripe soup that’s also supposed to be good for hangovers. It’s good stuff – although I wasn’t in need of its medicinal purposes when I had it! I like tongue, but one rarely sees it in the market anymore. When I was a kid, it was always in the meat case. Now, it’s a special order item. I haven’t had any for ages, and I’ve never prepared it. Time to have some, don’t you think? Good post – thanks. I have never seen or had beef tongue before…decades of years ago, I had some pig tongue and I remember it’s quite delicious, but as good as beef tripe. p.s Wheat germ in bulgur bread is optional. I have also baked this without using wheat germ and it’s perfectly all right. I had tongue for the first time in London…and I was surprised at how much I enjoyed it! I haven’t been able to prepare it here yet (beef tongue is harder to find in the states) but your recipe has inspired me to look again. I always told my son, who is a very good hunter, if you shoot it, you eat it. Tricia, that is a good advice for a hunter. I don’t believe in hunting/killing for pleasure. I love deer meat! Wish I knew some people here who goes deer hunting. I’m fine with all things beef and pork but I simply CANNOT handle chicken. I had an anatomy professor in college ruin me on raw chicken and eggs. So gross. And I find I quite like tongue! I had some at a farm to table event last year, and I felt obligated to try it despite my reservations. I’m not sure I’d go out of my way to eat it but i was happy with how it tasted. Just can get over the phantom tongue pain!! Hmmm. I will usually try just about anything. Have decided I don’t like escargot after attempting several times. It’s a texture issue. I love pate and make my cornbread dressing with chopped chicken liver and gizzards. I am always intrigued by how many countries A. Bourdain travels to where they eat so many parts of the head…brain, tongue, eyeballs, etc. Actually, it seems like we are the most squeamish in the U.S.
I’m your kind! Oh the chicken livers my niece made while we were home made me order them together with my chicken rice all the time now! They were so good! Whenever I leave a whole chix to marinate in the fridge overnight, my husband gets grossed out each time he opens the fridge door! I had tongue in Mexico and loved it. The texture was definitely unique, but enjoyable. I will admit, however, that I am one of those people who does not like to handle meat, and for that reason I am primarily a vegetarian at home. I have, to date, been so adventuresome as to roast two chickens and a duck. I was pretty proud of myself as I reached my hand into their raw cavities to pluck out the innards. And, oddly, I doubt I would have no problem hunting my own food, as long as someone did the cleaning / butchering. I’m not sure what it is, but the handling of raw meat is just not for me! Hi Ilke! I have to jump into this post after I saw this post on your home page! I am not sure if you read my beef tongue post, but Japanese do eat beef tongue, usually BBQing! I heard from several people how beef tongue was eaten, and heard the process but never seen any pictures of it. I’m so glad you posted it and I thoroughly enjoyed your post. Your version looks very fancy. Our version is grilled – and the meat is very thin, and dip in lemon + salt sauce (in the post I dip in yuzu). 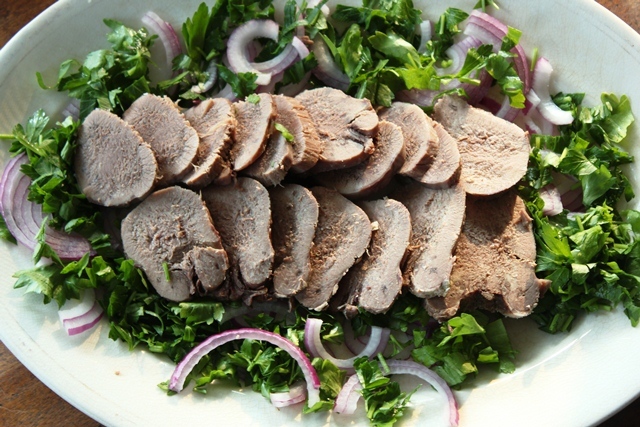 If you are curious, I hope you check out Japanese version – please allow me to share the link here in case you’re curious(http://justonecookbook.com/blog/recipes/gyutan-bbq-beef-tongue/). i love tongue. my mother cooks it so good and i need to learn her recipe. it is similar to your recipe, but she puts carrots and parsnips in the pot. here, in macedonia, we eat different parts of the animals, beef liver, kidney, pork legs, lamb brain… my grandmother even prepared a soup with whole lamb head and lots of parsley. i like to eat all that, but haven’t tried to prepare it, except liver.